What is the difference between a multi-user and single-user license? A single-user license includes a key for each copy Orderingd. A multi-user license includes one key with permissions to install the software on multiple workstations. What does "per user" mean? One user may install and use one copy of the software product on a single computer at a time and only by one user at a time. We are committed to further development of our software. We regularly release new versions with bug fixes, improved functionality, and increased performance. We provide Free Lifetime Upgrades for all our registered users. New versions of our products can always be downloaded from our website. Your current registration number will continue to work with new versions. I lost my registration key... What to do now? Email address at the time of Ordering. If you are not sure, please list all addresses you could have used. You can make a feature request by sending us an email. If it would be an enhancement to all our customers, we will add it to the product. How safe is my online Ordering? All transactions are handled by PayPal and uses the highest level of encryption throughout the entire order process and credit card processing. All transaction and credit card information is guaranteed to be safe and not passed on to any third party. Note the ‘https' which indicates that our trusted transaction company is using at least the industry's standard Secure Sockets Layer (SSL) technology. All transactions are Guaranteed to be 100% Secure! How do I know this program is a legit program and not contains a virus or trojan? 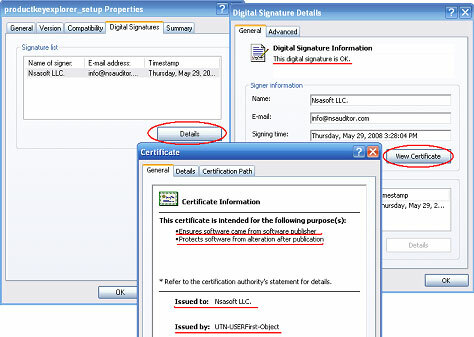 Nsasoft is a trusted company, all our programs are virus or trojan free and signed with Nsasoft digital signature. To see it just download any program from our web site, right click on executable file and from pop-up menu choose “Properties�? menu item. Then in an opened dialog select “Digital Signatures�? Tab and press “View Certificate�? button. Nsauditor primarily designed to monitor from inside the network, correct? Nsauditor combines the functions of a port scanner - network auditor and a network monitor, the program includes Intrusion detection system based on Security Events Log analyzer and notifies of possible intrusions - attacks by using E-mail, Net Send, Speech Recognition methods or by playing user selected voice file. Single installation on one computer in a small (5-25 computers) network audits the whole sub-net or does a copy have to be installed and run from each machine? Software licensing based on "user licenses" scheme, by number of administrators or users who will use the program. 1 User License - single installation on one computer allows scanning of all subnets, but this license allows installing the program only on one computer and monitoring security events from the same computer. 5,10,25,50,100,250 User License - single installation in one computer allows scanning of all subnets, but this license allows installing the program to corresponding number of computers. If I was to Ordering a block of licenses, could I install a single copy on each of my client's networks? Or do I need to Ordering a license for each of my clients individually? The license can be used by the number of users the license was issued to. If you buy for example 50 User License you can install it on 50 computers.